Just five months after the launch of the Serious Game Game In Flame – Battle Against Inflammation, the Collaborative Research Centre (CRC) 1181 at the University Hospital Erlangen is bringing the second update online. 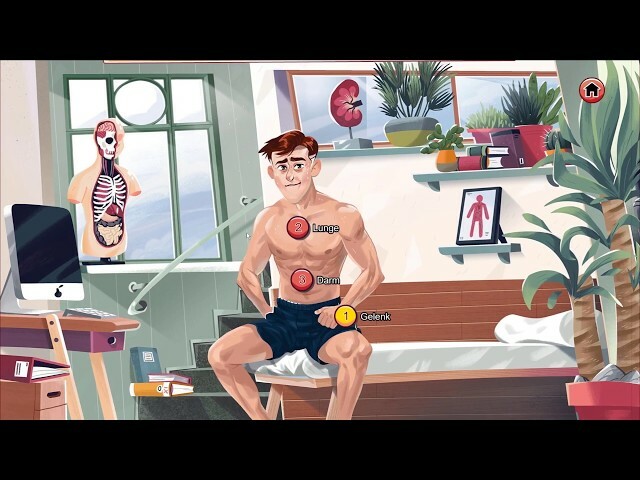 Under www.gameinflame.de the player learns, how it can come to an asthma attack and how this can be fought with a purposeful medicine therapy. In Germany alone, about 3 million people suffer from asthma, of which about 10 percent are children under the age of 15. Asthma bronchiale is unfortunately not curable so far, but fortunately there are numerous drug therapies. Every therapy has the task of efficiently controlling the inflammatory reaction and at best switching it off. It is important for chronic inflammatory diseases that patients can lead a normal life despite their illness. Affected persons and their relatives need comprehensive information about their illness and therapy. What happens to asthma in my lungs? The Serious Game Game In Flame – Battle Against Inflammation explains the molecular processes and therapies that are essential for the development, maintenance and control of bronchial asthma. Every day, foreign substances, so-called allergens, enter our bodies. If some allergens enter the lungs a second time, they irritate the immune system so much that it responds with a defensive reaction. How to fight or prevent an asthma attack is explained in the new world of the browser game Game In Flame. The player must strategically position leukotriene inhibitors and glucocorticoids wisely and eliminate the inflammatory tissue hormones (leukotriene) and eosinophilic granulocytes. Leukotrienes constrict the respiratory tract during an asthma attack, causing the patient to breathe badly. In order to win the fierce fight in the lungs and to control the inflammatory reaction, players have a few exciting special weapons at their disposal within the six levels in addition to the basic medications. The serious game “Game In Flame – Battle Against Inflammation” has been developed within the framework of the SFB 1181 to arouse interest in science, to raise awareness of chronic inflammatory diseases and to encourage patients to become more loyal to medication. In this way, complex content from science can be transported to the general public in a way that is generally understandable. In the long term, the increase in knowledge can increase the number of patients with chronic inflammatory diseases in remission, which could reduce the financial burden on health systems. The SFB 1181 “Switching Points for the Dissolution of Inflammation” led by the Department of Internal Medicine 3 – Rheumatology and Immunology (Director: Prof. Dr. univ. Georg Schett) at the University Hospital Erlangen of the Friedrich-Alexander University Erlangen-Nuremberg was established in 2015 by the German Research Foundation (DFG) in order to find answers to the question of why inflammation in chronic inflammatory diseases cannot be switched off and damages the body.